Mako and RandyT mentioned ash cakes in another thread. 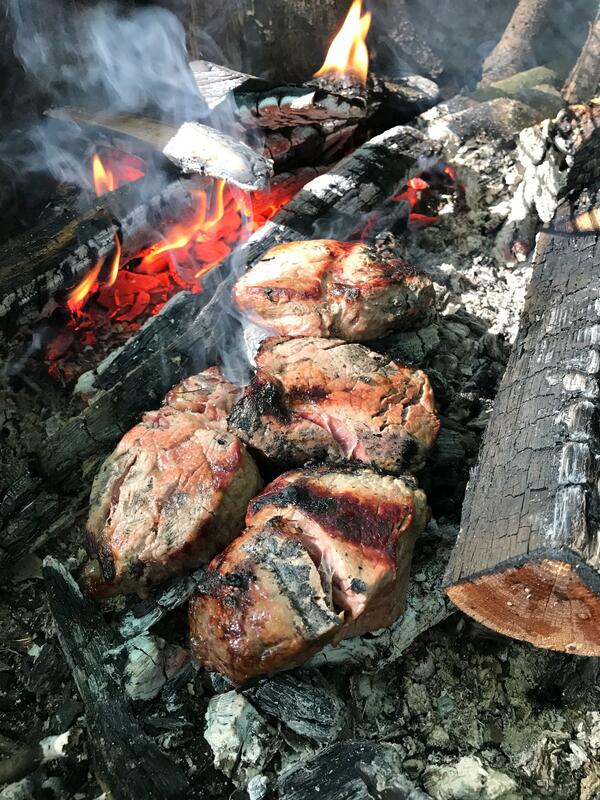 Although I've never tried those, I have cooked quite a few steaks on the coals of a fire. Hardwoods are what you want here. I've used maple and oak and both work very well. I've had less luck with lighter woods such as pine because it burns hotter and faster. Make sure you aren't using any kind of crazy toxic wood or anything. I don't want to be responsible for killing anyone off. You want a nice wide fire base. Build your fire up and then let one area burn down low to a nice hot bed of large coals. I find that split wood about 3/4" x 3/4" x 8" pieces, or a little fatter, will produce nice sized coals for cooking steaks. Don't pull your coals out of the fire, rather clear the higher flaming fuel off the top to expose your coal bed. You can surround the cooking coals with other pieces of firewood or rocks as a wind break and to reflect heat like an oven. It tastes really good. More importantly, if your plane crashes in the Alaskan wilderness and you didn't pack a frying pan, you can still cook that kodiak bear you just rassled to death. "What one man can do, another can do!" don't go native on me Dashing....wait a minute, yes do--please do go native on us!!! We're going to LURE him. Where is the Cabernet and the asparagus? Love me some steaks on the coals! Yum! !